There's serious disruption in the solid-state drive (SSD) market right now. Companies who are vertically integrated, defined as those who manufacture their own NAND memory, are using economies of scale to release ever-cheaper SSDs packed to the brim with features. Followers of SSD pricing will know that it's possible to pick up a decent 500GB drive for around £150, while entry-capacity drives are down to under £50. Even cheap SSDs tout headline-grabbing 500MB/s sequential read and write speeds. 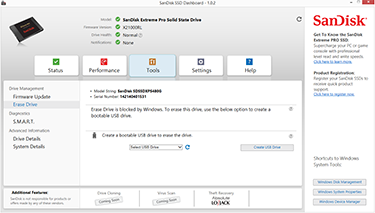 On these drives the potential of the NAND and controller is oftentimes held back by the limitations imposed by the SATA 6Gbps interface we're all familiar with. 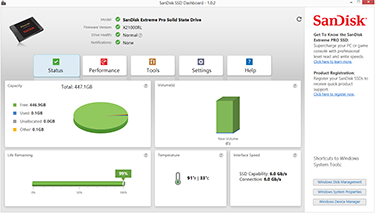 The same drives have random IOPs performance - loosely defining the speed when dealing with very small files - in excess of 50,000 operations per second. Armed with the knowledge that cheap SSDs from reputable companies are decent for the bulk of consumer users, particularly if they're coming from a mechanical drive, do premium SSDs still make sense? SanDisk seems to think so. It's one of the select few to manufacture NAND and integrate it into SSDs primarily found in OEM systems from the likes of Dell. Yet SanDisk is making its presence felt in the retail space. With four SSD families for the consumer drives and five for the enterprise space, there's a solution for every user. Headlining the consumer division is the Extreme Pro range of SSDs available in 240GB, 480GB and 960GB capacities. Let's take a closer look. The Extreme Pro follows on from the regular Extreme launched two years ago. That's a long while in the SSD world for an evolutionary drive. In that time, SanDisk has upgraded the SandForce SF-2281 controller to a Marvell 88SS9187, and the NAND from 24nm Toggle Mode to 19nm MLC here. SSD performance is a combination of NAND, controller and, crucially, the firmware that ties them together. Larger companies tend to have bigger development budgets for fine-tuning firmware and providing ongoing support during the product's life cycle. Scanning the specs reveals the kind of numbers we routinely see on high-end consumer drives. We'd urge SSD makers to list the specifications of their drive when in a sustained-level state, intimating performance once it has been well-used, but few do this. The 10-year warranty is well above the average for the industry. Endurance, too, is good for a consumer drive. The 80TB total bytes written figure is the suggested lifespan of the drive once advanced wear-levelling techniques have been taken into account. This represents average writing of 22GB per day, every day, for 10 years, and if you expect to be doing much more than that you ought to look at datacentre-specific SSDs. What the base numbers don't show is the consistency of the Extreme Pro once in a well-used state. This is the key metric by which we evaluate modern SSDs; all drives produce blisteringly fast number when fresh out of the box. 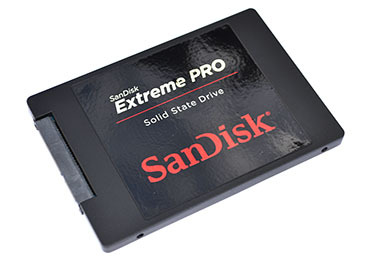 On this point SanDisk says the Extreme Pro is very consistent in both new and degraded states, beating the likes of the Samsung 840 Pro and Crucial M550 in internal benchmarks. We'll be putting their word to the test in our slew of benchmarks. Following on from the trend last year, SanDisk's Extreme Pro stands at 7mm tall, making it useful for including in Ultrabooks and genuinely thin-and-light laptops. Equally at home in a regular PC, a 2.5mm adapter is bundled to aid installation in standard chassis. There are no surprises in terms of appearance. 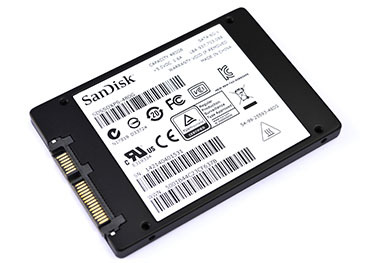 An aluminium enclosure has typical SanDisk branding on the front. Drive model number and capacity - 480GB in this instance - are shown on the back. The enclosure is lighter than others we have seen in recent weeks; SanDisk reports a 61g weight for the drive. Far more exciting is what's inside. SanDisk uses eight NAND ICs each containing 512Gbit (64GB) of capacity. We know that SanDisk is using the second generation of its 19nm process, codenamed '1y', where cell size measures 19nm x 19nm, compared to 19nm x 26nm for the first-generation process. It's not clear why SanDisk chose an asymmetrical cell structure on the first-run parts. 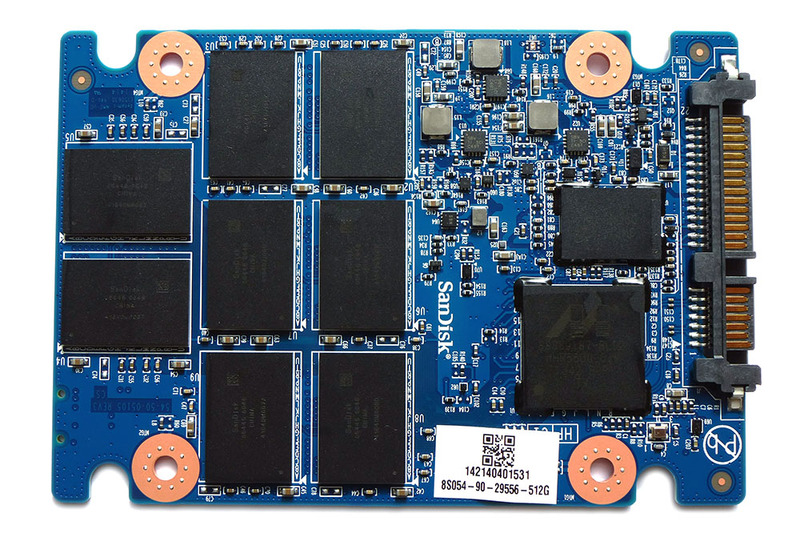 The company is moving to the '1z' process soon, revealing it will implement Samsung-like 3D NAND technology present in the Korean company's 850 range of SSDs. Symmetrical small cell structures mean the lowest possible manufacturing cost. Marvell is again the go-to choice for the controller. The third-generation 88SS9187 has been a popular choice for mainstream and some enthusiast SSDs in the past year. Other companies have moved on to updated 88SS9189 part, considered a minor refinement of this controller, though, clearly, SanDisk has faith in proven technology. Buffering operations is DDR3 memory situated just above the controller. Hardware specs only get you so far with an SSD. Just as important is the quality of the firmware interfacing with the drive and the operating system. 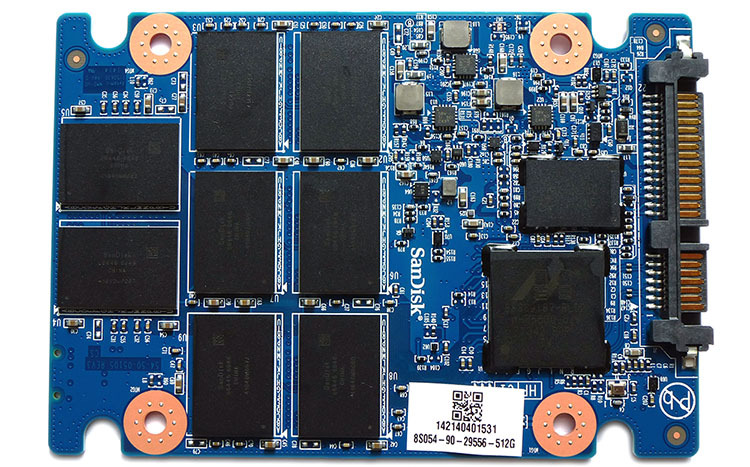 Those who produce their own NAND have far more insight into how the various chips tie together to form the complete SSD package, and SanDisk is hoping its expertise pays off in the performance benchmarks. There's a little more to the Extreme PRO than first meets the eye. SanDisk incorporates nCache technology first presented in 2009. Here, a small portion of the MLC NAND acts like single-bit-per-cell SLC, and it is used to aggregate small random writes and send them over to the nonvolatile cache before flushing them permanently, in bulk, to the MLC NAND. The nonvolatile nCache has the advantage of being able to store data for longer periods until an idle flush opportunity becomes available, and in addition to improving random write performance, it should also reduce write amplification, which in turn bodes well for drive longevity. Operating systems tend to write lots of small files in a bursty manner, bringing the benefits of nCache into play. What we don't know is just how large this nCache size is on the Extreme Pro and whether it's user configurable. 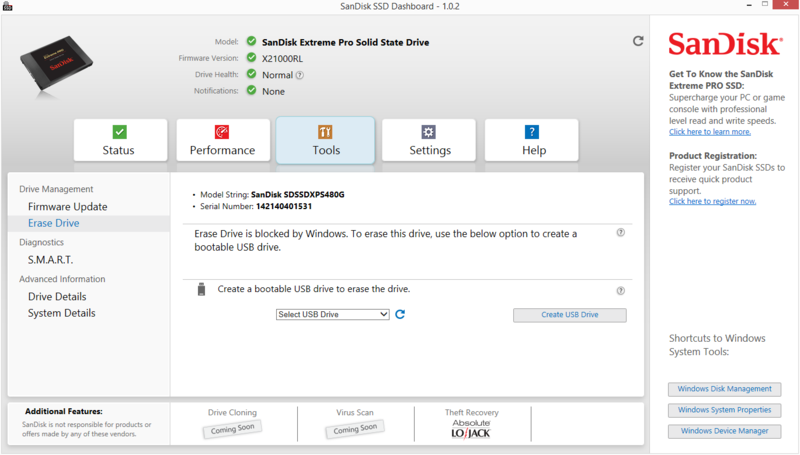 And a final word about drive longevity on this model, SanDisk keeps a nominal 32GB aside for overprovisioning and use by nCache technology. The user has no access to this capacity, and the drive formats down to 446GB in a Windows environment. SanDisk includes a download link for its SSD Dashboard software. There's no glossing over the fact that SSDs endurance is reduced in direct correlation to the number of writes. Rather than provide a meaningless bytes written feature present on some, the Life Remaining section offers an at-a-glance figure for how long the drive should last. The more you write, the more the cells weaken, and shorter the lifespan of the SSD. Updating firmware and a secure-erase function (via a bootable USB stick) are supported, too. SanDisk's premier consumer SSD, the Extreme PRO, is targetted towards the enthusiast who cares about long-term performance and support, and not merely about pure out-of-the-box speeds.